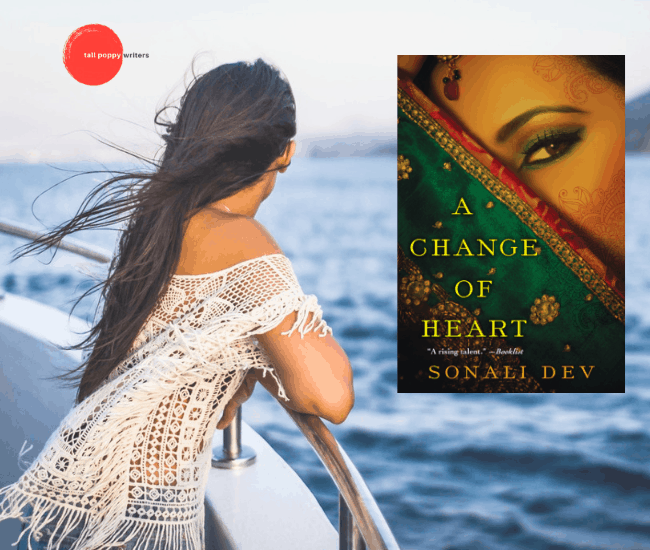 Sonali Dev’s third novel, A Change of Heart (Kensington), opens with Dr. Nikhil “Nic” Joshi, a former Doctors Without Borders physician, who’s working as a cruise ship doctor. He’s drinking himself to death while alternately chasing down, and hiding from, the ghost of his wife, Dr. Jen Joshi, who has been dead for 2 years. She was murdered before his eyes, along with their unborn baby. When a stranger, a Bollywood dancer named Jess Koirala, shows up on Nic’s cruise ship knowing and saying things shared only between Nic and Jen, Nic is gutted. But then comes the real shocker, the stranger shows Nic a jagged scar and tells him that she has been given Jen’s transplanted heart. Not only that, Jen has also been communicating with her from the other side. While Nic remains skeptical, he is pulled in by Jess’s compelling story and becomes consumed by her. He is utterly obsessed with finding out the real truth about Jen’s murder. But Jess wants him to focus on something else. Jess doles out information about her own past in small bites. She has a son named Joy staying with her flatmate and friend back home, who she is anxious to get back to. She also has a past trauma that is haunting her like a nightmare. Jess lets Nic into her world slowly. The resulting journey is one that will unravel a dark ring of organ trafficking, unspeakable violence, and crime in Calcutta and Mumbai. The fast-paced mystery plot is beautifully interwoven with the very personal story of Dr. Nic and Jess, two grief-stricken people finding their way back to life – and back to love. Jen shows up in this story as well, although not in the way you might think. Every chapter begins with an excerpt of her diary and the reader will appreciate hearing her voice from the past as the story unfolds. A Change of Heart is connected to Dev’s prior novel, The Bollywood Bride, which featured the wedding of Nic and Jen as a backdrop, but focused on the story of Ria and Vik. Ria and Vik make important appearances in A Change of Heart too. But really, this novel can stand on its own. If Sonali Dev is a new author for you, I promise you it will make you hungry for more of her layered storytelling and gorgeous prose. Sonali Dev’s A Change of Heart is a raw, poignant and heartbreakingly beautiful story of courage and the resiliency of the human spirit. I highly recommend! A Change of Heart is available for purchase. Award-winning author, Sonali Dev, writes Bollywood-style love stories that let her explore issues faced by women around the world while still indulging her faith in a happily ever after. Sonali’s novels have been on Library Journal, NPR, Washington Post and Kirkus Best Books of the year lists. She has won the American Library Association’s award for best romance, the RT Reviewer’s Choice award for best contemporary romance, the RT Seal of Excellence, and is a RITA Finalist and has been listed for the Dublin Literary Award. Interesting story! I would love to read this.